With over a dozen English-language books on the topic in the last decade alone, the ill-fated love story of the 12th century French scholar-monk Peter Abelard and his pupil Heloise continues to fascinate modern writers and readers. 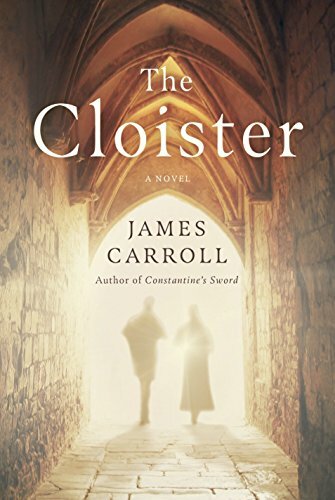 “They were the Romeo and Juliet, Tristan and Isolde, Lancelot and Guinevere of la France,” muses the French-Jewish museum tour guide Rachel Vedette, one of the main characters in National Book Award-winner James Carroll’s new novel, The Cloister. Now, Carroll–-himself a former ordained priest—has taken this medieval romance as an unusual springboard to investigate historic Catholic doctrine and crimes, the theme of most of his previous 19 books of both fiction and nonfiction. Well, this couple might not be the best role models: Abelard was castrated by his enemies, and Heloise was sent to a convent. Fortunately, The Cloister has a second pair of heroes: Father Michael Kavanagh, an Irish-American priest plagued with doubts about his church; and Rachel, the guilt-ridden tour guide and Holocaust survivor. Their story and their philosophical debates, set in New York City in 1950, provide an intriguing stream of historical, religious, geographic and plot crosscurrents with the medieval tale. Kavanagh’s life as an obscure parish priest is shaken when his long-lost seminary friend John “Runner” Malloy shows up at mass, then bolts from the Communion rail. In trying to pursue Malloy, Kavanagh stumbles into The Cloisters, a famous Manhattan museum near his parish that is actually built from remnants of five medieval French religious houses. But behind what Rachel calls his Jimmy Stewart persona, Kavanagh is actually as emotionally closed and troubled as Rachel. Fumbling, the two develop an unlikely friendship ostensibly based on discussions of the study of Abelard and Heloise that Rachel’s father, Saul, a renowned scholar, had been undertaking before he was murdered by the Nazis. In particular, Saul Vedette had hoped to prove that Abelard vigorously challenged the official Catholic doctrine condemning Jews as Christ-killers. If Abelard had won his theological battle with the monk known today as St. Bernard, there might well have been fewer pogroms against Jews over the centuries, a weaker Inquisition, perhaps no Hitler. Abelard’s many “heresies” tug at Kavanagh’s own long-suppressed doubts about Catholicism. But are he and Rachael also using their religious-historical dialogue as a shield to hide—from themselves—a budding romance nearly as forbidden as that of Heloise and Abelard? The possible romantic parallel is just one of many crosscurrents that make The Cloister a literary detective game, even if some of the historic references, including Abelard’s supposed friendliness toward Jews, are debatable. Abelard and Heloise might have walked in some of the same cloistered hallways as Kavanagh and Rachel; Kavanagh’s debate with a colleague about Jews and the blood libel echoes Abelard’s debates with his fellow monks. But overall, the parallel holds. Indeed, in pushing his readers—in both his fiction and nonfiction—to ponder tough religious topics like church-endorsed anti-Semitism, child molestation by priests, the ignoble role of the Catholic Church in World War II, and alliances between the church and corrupt politicians, Carroll is continuing the important discussions made famous by Peter Abelard.